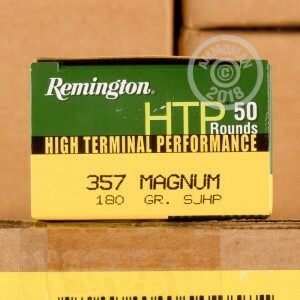 Answer things that go bump in the night with this heavyweight .357 Magnum load from Remington. This cartridge is put together using proven components including reloadable brass casings, non-corrosive Boxer primers, and clean-burning propellant. 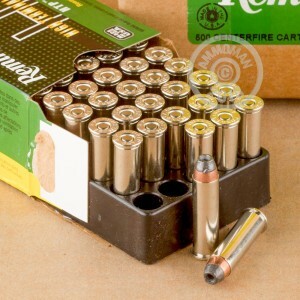 Each round is topped with a semi-jacketed hollow point (SJHP) bullet which wears a strong copper jacket all around its body save for the exposed lead tip which houses a hollow divot. While traveling into a target, the hollow cavity will promote wide expansion while the jacket will prevent the mushrooming bullet from reaching optimal diameter until after it penetrates deep into the threat. This ensures proper energy transfer to vital organs which is paramount in a self-defense situation. The 180-grain pill is inherently longer and intended to grab onto a greater degree of rifling to promote better spin stabilization and accuracy when fired from larger revolvers and lever-action carbines chambered in .357 Magnum. 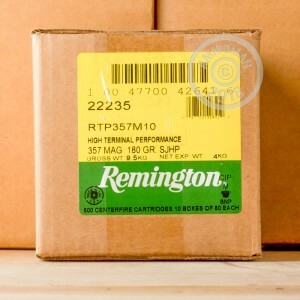 Remington is a timeless name both home and abroad which is attached to some of the most successful calibers and firearm actions in the world. Their HTP line takes full advantage of over two centuries of manufacturing experience alongside refinement spurred on by real world data.